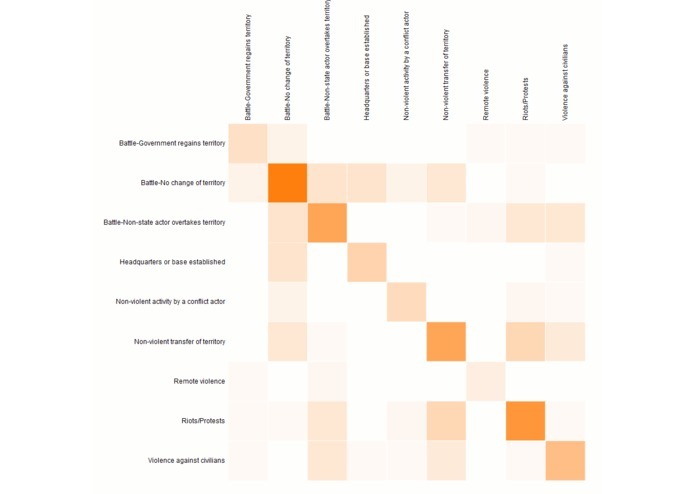 Prediction and visualization of armed conflict events. This project aims to predict and visualize armed conflict data for African states. Realtime data can be obtained from ACLED (Armed Conflict Location and Event Data Project). Prediction module uses Numenta's Hierarchical Temporal Memory (HTM) model, which is based on a brain-inspired theory of neuroscience. A co-occurence matrix based on d3.js is used for predictive visualization. This type of matrix is normally used for text-mining. For this project, rows correspond to actual events while columns are predicted events. Darker cells indicate more frequent co-occurrence of actual and predicted events. The primary motivation is to learn about Numenta's HTM framework. A secondary motivation is to explore techniques for categorical prediction and predictive visualization. I modified the inputs to better represent the data file. The HTM is learning sequence of events per country. As a side effect, memory usage is reduced slightly and training time is a bit faster.